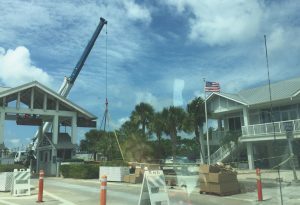 ■ STAFF REPORT – The installation of the Boca Grande swing bridge’s new scale lane is almost complete, and it is scheduled to reopen on Monday, Aug. 28 at 5:45 a.m. The Gasparilla Island Bridge Authority originally installed the truck scale in 2000. Removal of the old scale began on Monday, July 31. GIBA Executive Director Kathy Banson-Verrico said that over the past year there have been issues with pinion movement during bridge openings. During the current closure, the machinery contractor has been onsite to install dowel pins in each lower bearing. This repair process requires hours of precise drilling. Therefore, it is imperative that the bridge is stationary during the repair. The channel closure has been approved by the United States Coast Guard. Since the scale closure, larger vehicles could travel across the bridge in the other lanes from 5:45 a.m. to 5:45 p.m. daily if the driver could provide a weight ticket (from the same day) from a State-certified weight scale proving the gross vehicle weight is less than 80,000 pounds. Other large vehicles that had a proven weight history with GIBA were permitted to go through one of the other toll lanes without a weight ticket. For more information, visit giba.us.